About 10km. (6 miles) taking 3 hours. Can be shortened to 8km (5 miles). From the quarry turn right along the road, towards the Crag Inn.On the left, just before the Inn, is a footpath sign and stile.Go through the stile, across the footbridge and continue forward, bearing slightly right, cross a stream and follow the path uphill following the wall on the right. Go through a stile leaving the wooded area and follow the wall on the right. Ignore a footpath off to the left, and continue to follow the wall as it bends round to the right. After rounding this curve, cross a footbridge and bear slightly left across the field and another footbridge towards the far corner.Before the corner is reached there is a gateway in the wall with a footpath crossing your path and leading through the gateway.Do not go through the gateway; instead turn sharp left, towards the farm. Proceed to the farm, and go through a gate with the farm on the left.Follow the track to a road.At this point there is a good view of Shutlingsloe, the hill to the left. Turn right up the road which soon bends right. On the bend there is a track to the left with a signpost to Three Shires Heads.Follow this track between trees and through a gate.Go uphill, with a wall on the left, and on nearing the top of the hill, bear right towards a clump of trees and a stone byre. The path passes to the left of the trees and leads to the main road from Congleton to Buxton.Cross this road and over the stile, immediately turning right to cross the stream, and then taking the path to the left. When the path divides at a stile, continue forward over the stile in the fence and across the broken-down wall and bear left towards Cut-thorn Farm and proceed to the corner of the field adjacent to the farm.Cross the stile, turn right on to the road and immediately take the track on the left. (At this point there is a sign regarding dog restrictions on this grouse moor) Ahead, along the track, the beautiful valley of the river Dane comes into vies. The path leads downhill and eventually to an ancient stone bridge, this is Three Shire Heads, the meeting point of Cheshire, Staffordshire and Derbyshire. Do not cross the bridge but continue keeping to the left of the river, on the Cheshire side until a gate is reached. At this point the routes for the long and short walks divide. Cross the road to a track signposted to the Cat and Fiddle Inn.Follow this track as it wends its way downhill to cross Cumberland Brook.After crossing the brook immediately turn left through a gate. At this point the short walk rejoins the route of the long walk, further directions for the short walk are given from (*) onwards. Long Walk. Cross the fence via the stile on the right immediately before the gate and take the path which follows the river; eventually, after passing a stone byre the path climbs up the hillside.Ahead on the left, is a stone chimney, the relic of a past industrial enterprise, continue past the chimney high above and two hillocks on the left until the brow of the hill is neared where a path is seen coming up from the other side of the hill. Turn sharp left on to this path and proceed to the main road.Turn right on the road and, on the brow of the hill, turn left over a stile.With the fence on the right, walk for about 800m. 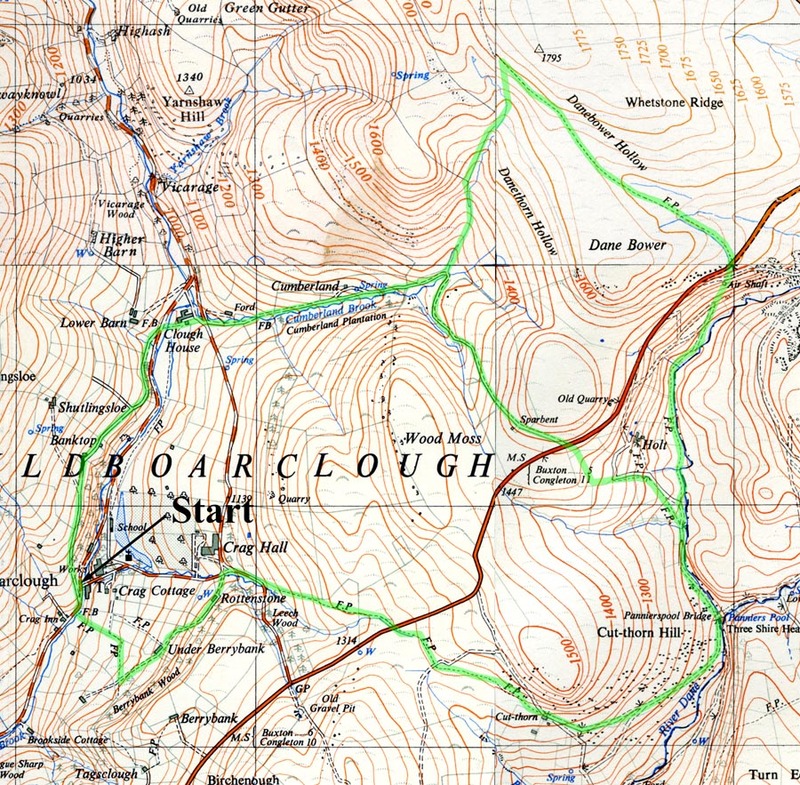 until a path coming up from the left is reached, signposted Wildboarclough. Take this path down the hill, following the stream until it joins another stream and falls into a ravine. Do not cross the stream, take the route through a gate on the right. At this point the long walk rejoins the short walk, both walks continue as follows. (*) Through the gate is a track, follow this and then shortly after crossing a stile, turn left over a bridge and walk down to the road. Cross the road and on to the farmyard opposite. Go through the farmyard and at the end of the buildings on the left, turn left through a gate and immediately right, across the field to a footbridge leading to the road. Go across this road and follow the path, which leads to the left. Cross a stile and stream and continue along the clearly defined path leading past Bank Top to a lane which leads downhill to join the road running in the bottom of Wildboarclough. Turn left at the road back to the starting point.